On July 19, 2016, Donald Trump won an entrenched party nomination as its candidate for president. Time elapsed: 10 months and ten days after he said nice things about the LP.org. On November 8, 2016 Donald Trump was elected President. Time elapsed after Trump’s original pro-libertarian comment: 14 months. George Waffen Bush’s first Executive Order establishing a faith-based Fifth Column within the federal government led to a predictable asset-forfeiture Crash and Great Depression. Folks recalled the time when the Great Depression was brought on by Herbert Hoover’s prohibition enforcement policies, and the Republican Party had a problem. Running an overdone faith-based invader of the opium regie in Vietnam failed miserably in the 2008 economic collapse. Nobody mistook McCain’s anti-choice running mate for Tonie Nathan. Nominating the leader of a prohibitionist, anti-choice mystical cult in the 2012 Great Depression also failed. At a time when voters correctly surmised that government action by entrenched politicians had again wrecked the economy, Trump sewed up the Gee Oh Pee nomination ten months ahead of time with those 8 words: “I like it. A lot of good things.” The Libertarian Card was Trump’s implicit threat of running for office on the Libertarian Party ticket. When Trump spoke those words, God’s Own Prohibitionists suddenly remembered how Ross Perot’s spoiler votes had cost their party boodle, pelf, handouts, grants, paychecks, subsidies and jobs in the middle of a prohibitionist asset-forfeiture depression. 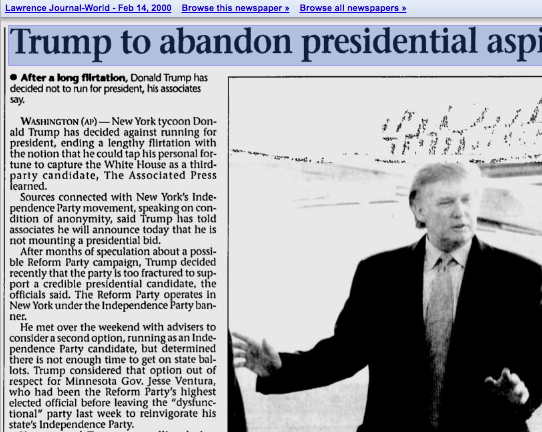 Trump had foreshadowed the strategy WAY in advance… 16 years before closing in for the kill. The same thing happened to President Taft, when Teddy Roosevelt swung the election to Woodrow Wilson. Nixon won in 1968 despite George Wallace taking the ku-klux vote. But Nixon’s Moral Majority Republicans adopted Dixiecrat bigotry so fast you’d think George Wallace had won every electoral vote and become Grand Goblin himself. Nixon also got the tax code changed to inject subsidies into entrenched looter party campaigns–this within 24 hours of the Libertarian Party forming. FDR’s victory came entirely thanks to the Liberal Party of America. In a Gentlemen’s Agreement, that party faded into the background once the Democratic platform followed their example by adopting a prohibition repeal plank. Herbert Hoover’s tax-law prohibitionism had so thoroughly wrecked the economy that voters stayed away from Republican prohibitionists for five consecutive elections. The Libertarian Party’s four million spoiler votes cast a long shadow over the three million or so popular votes that Hillary wishes had made her the “real” winner. The Democratic party wishes it had copied the Libertarian planks on relegalization and energy instead of listening to econazis and pushing for National Socialist gun laws. Threatening to make electricity illegal and pass socialist gun laws was the height of disqualifying stupidity.